Hilton HHonors has triple points offer going on for stays of minimum two nights that are booked and consumed by January 30, 2016. You must use ZZTPT1 or Z3P rate codes and then choose the triple points rate plan. When you execute the search, hotels that have “Promotion/Offer code” under the price have the rate plan available. 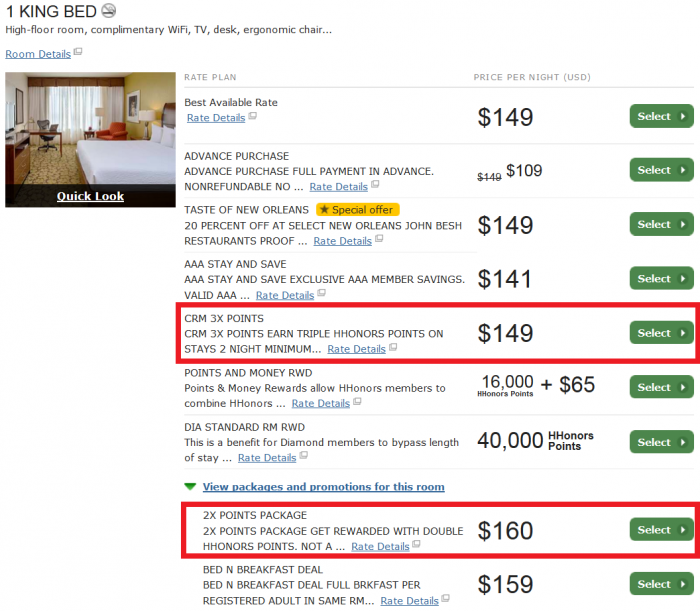 The triple points rate is the same as the Best Available Rate while the double points package rate is higher. Booking this rate make sense WHEN there are no discounted rates available or you are allowed to book a “best flexible” type of rate plan (and then collect triple points for yourself). In this HGI New Orleans case, I would book the advance purchase rate that is a lot lower IF my plans would be firm. Offer valid at participating hotels and resorts in the Hilton HHonors™ portfolio in the Americas. Subject to availability. Valid for stays between January 1, 2015 and January 31, 2016. Must book Plan Code “ZZTPT1” or “Z3P”, online only. Minimum two night length of stay required. Offer valid for all days of the week. Rates are valid for single/double occupancy and are exclusive of all taxes, gratuities, incidental charges or resort fees (if applicable). Each hotel’s change and cancellation policy varies. Please contact the individual hotel to confirm their policy. Offer components are non-transferable or redeemable for cash, and cannot be applied toward future stays. This offer may not be combined with other select promotions, offers or discounts and is not valid for groups. “Triple HHonors Points” means Member will receive a bonus double the number of Base Points earned during a stay. Bonus Points earned on Base Points do not count toward elite tier qualification. Please allow up to eight weeks from completion of your stay for points to appear in your Hilton HHonors account. You must be a member ofHilton HHonors to take advantage of this exclusive opportunity.